Hi guys, hope you are doing well. I can not tell you how glad I am that I could empty my "empties" box. And the funny story is, I already start filling it again. 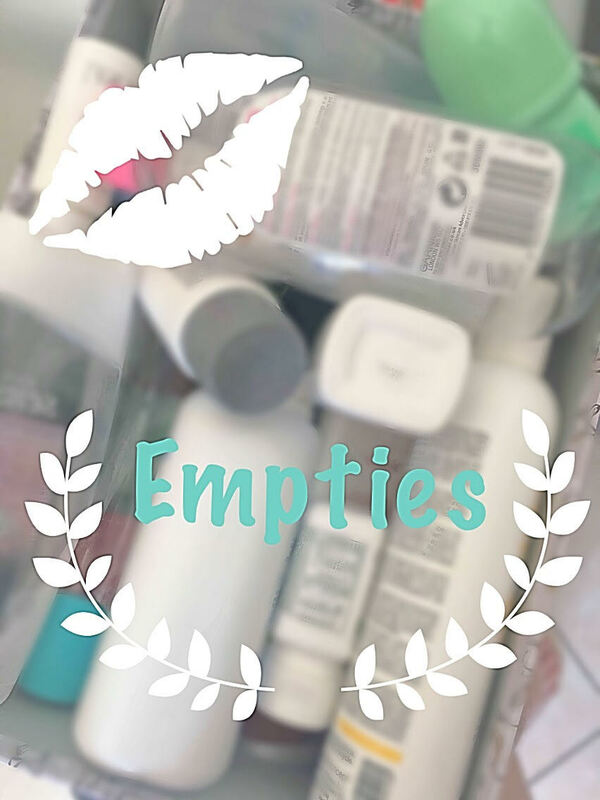 Empties is one of my favorite videos to watch. It gives me an insight into other people's skincare routines and it fuels my "want-to-get" list. In this post I will show you all my beauty trash and if I will repurchase. You are not seeing double, I actually have finished two bottles in a couple of months. I use it mostly to control oil. Now wait before you judge. Dry Shampoos are amazing and I love using them, but they are so expensive compared to the Baby Powder. Now I have long hair and it is kind of a light brown color, so I can get away with patting away the white cast. I am also trying very hard to not wash my hair every day anymore as it's not really healthy. So Baby Powder is the next best thing and for me it works perfectly. Repurchase? It's quite the splurge combination, retailing at over R300 per bottle. I just feel that although it did well and my hair looked and smelled amazing, I can not justify spending almost R700 on shampoo and conditioner. It did not blow off my socks. The Dove I got in some box and it's meh. I am so used to my Mitchum that I did not really gave it a try during the day. I did however enjoyed using this at night after I showered. I can not even begin the explain the love affair that is going on with this product. I think I mentioned somewhere that I am almost willing to hire out my husband to afford this product. It makes my dry patched vanish in this air, it smells lovely and just creates a well prepared canvas. It's also part of my night routine and I will have to start saving up soon cause my bigger size is almost finished as well. Repurchase? Hell yes!! I'm already contemplating which bank to rob as this is an expensive affair to have. A lovely day to day moisturizer. Another expensive item but considering it lasted me about a year (using it almost everyday). It's light weight on the skin but can pack a punch. These are the two daily vitamins I take and I have recently added a third. I think vitamins is a personal preference. Some people believe it's expensive urine and I tend to agree if you do not listen to your body or look out for the signs, but I firmly believe in a good Omega-3 Vitamin and I found that this is an excellent one. This is my favorite lip scrub and the popcorn scent is just delicious! I will buy this over and over and over but I got a different scent from a friend and I'm thinking it's coming close to my favorite. This purchase was brought on by the lovely Amelia Liana. It's an amazing setting powder and it never made my face looked cakey. On the inside this compact has got a mirror and it allows for easy application but also to apply other makeup like liquid liner and so forth. When I look at this blush, for some reason I think "Ballet". It's girly and pretty and creates the most beautiful healthy flush. It has got tiny, like microscopic glitter, but it does not really transfer to the skin. Wow Purple mascara - was a fun mascara but the quality was not the best. Gosh Amazing Lengthen Build - This was a great day to day mascara. Clinique High Impact Mascara - My first holy grail mascara, I have not used this in a very long time but before this is all I believed in. Out of all three this is the only one that I will repurchase one day maybe - too busy trying out new and other mascaras. Revlon Color Colorburst - Well I think that was what it was called. I enjoyed this liner and used it all to the end. Stila Stay All day Waterproof liquid liner - A brilliant liquid liner that is easy to use and apply but also easy to removed yet it literally stays all day. I already repurchased this and I got it in multiple colors. Stunning! !